Pandan Sticky Rice (Xoi La Dua) is another easy and tasty rice cooker recipe: Glutinous rice is infused with Pandan essence to make a wonderfully fragrant and delicious treat. This dish is a cinch to make in the rice cooker. To serve, top the sticky rice with a generous amount of sweet coconut sauce and roasted sesame seeds. Enjoy the Pandan Sticky Rice for breakfast, dessert or as a snack! Wash the glutinous rice several times until the water is mostly clear. Soak the rice for 1 hour. Rinse the rice one more time and drain well. Put the rice into the rice cooker along with the water, Pandan essence and salt. Stir together combining all ingredients well. Set the rice cooker to “Cook”. Cook until it switches over to a “Keep Warm” mode. Stir the rice. Cover and cook for another 10 minutes in the “Keep Warm” mode. 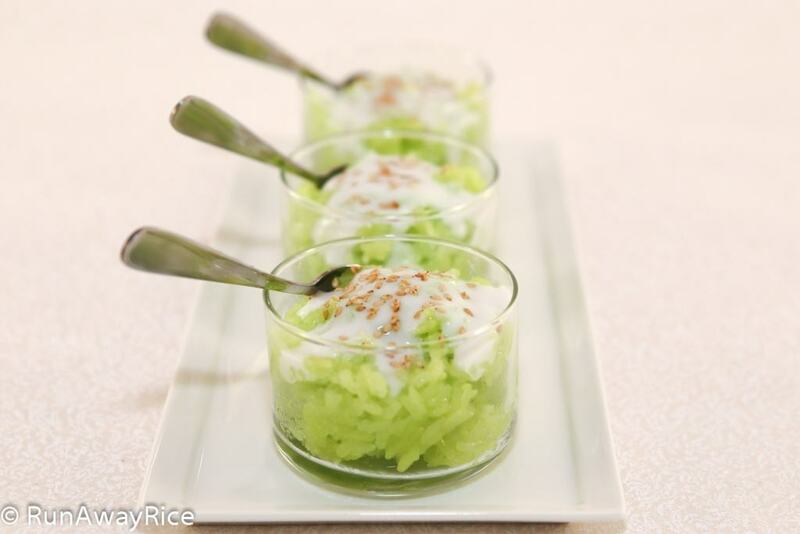 To serve, spoon the Pandan Sticky Rice into dessert bowls. Top with a generous amount of the sweet coconut sauce and sprinkle with roasted sesame seeds. Refrigerate any remaining portions. Enjoy within 2-3 days. Pandan Sticky Rice is another easy and tasty rice cooker recipe: Glutinous rice is infused with Pandan essence to make a wonderfully fragrant and delicious treat. This dish is a cinch to make in the rice cooker. To serve, top the sticky rice with a generous amount of sweet coconut sauce and roasted sesame seeds. Enjoy the Pandan Sticky Rice for breakfast, dessert or as a snack! Put the rice into the rice cooker along with the water, Pandan essence and salt. Stir together combining all ingredients well. Set the rice cooker to "Cook". Cook until it switches over to a "Keep Warm" mode. Stir the rice. Cover and cook for another 10 minutes in the "Keep Warm" mode. Hi! I made it today and the sauce, toasted sesame seeds turned out great! The rice was a bit on the soggier side. I think I’ll reduce the water if I make it in the rice cooker again. Thanks for the recipe! Hi! Have I see a lot of recipes have a knotted pandan leaf in with the rice along with the pandan extract. Do you think that might add to the flavor or is it unecessary? Yes, I love doing this! It infuses the rice with wonderful Pandan essence. Enjoy! Going to try this Sunday! Thanks! Awesome! Let me know how it turns out for you. Good Luck! Hi Trang, my children love having xoi for breakfast and I’ve made with both Pandan essence and paste. Both are equally delicious! Thanks for sharing this easy recipe!